Quality control is a vital piece of any manufacturing jigsaw, particularly when the precision components rolling off production lines are safety critical, for example. Your customers expect their orders to be fulfilled correctly and on time. Scrap and rework is expensive, plus there’s no telling the cost to your business in terms of damaged reputation each time you fail to deliver. Though traditional part measurement methods (co-ordinate measuring machines, height gauges, micrometers, shadowgraphs, calipers and the like) can be time-consuming, unreliable and prone to human error, their use continues to be widespread. We all know that people are resistant to change, but times are fast moving on. In modern manufacturing there is a proven better way of doing things, using an automated optical measuring system that delivers fast, consistent results regardless of the operator or component complexity, right in the heart of production. With world-leading, non-contact, high-resolution optical metrology solutions such as the VICIVISION Metrios, production efficiency can be dramatically increased. One machine can now perform the work of what once required many, more readily satisfying the speed and accuracy demands which can help unlock the door to a company’s potential to cater for growing client bases. TRADITIONAL TOOL: Variable results – When using a gauge or micrometer, the operator can unintentionally influence measurement results. Values may vary depending on the use of the instrument and how it is positioned on the part. OPTICAL MACHINE: Objective results – The measurement tools automatically detect the measurement points. The operator may change, but the results do not. TRADITIONAL TOOL: Contact measuring – In contact measuring, pressure may influence the values, especially if the material of the part being analysed is deformable. OPTICAL MACHINE: Contactless measuring – The machine performs measurements by using a contactless optical system, composed of a high-resolution camera and separate lighting systems. TRADITIONAL TOOL: Results influenced by temperature – The shop floor is not always a temperature-controlled environment. Any variation in conditions can produce unreliable results. In some cases, the measurements taken on the same part in a morning can be different to those taken in the afternoon, all due to temperature changes. Measuring in a temperature-controlled metrology lab may cause queues and lead to inefficiencies during inspection. OPTICAL MACHINE: Results uninfluenced by temperature – The machine is immune to the shop-floor’s environmental conditions and temperature variations. The on-board step master and temperature sensors monitor the thermal deformations of the machine. 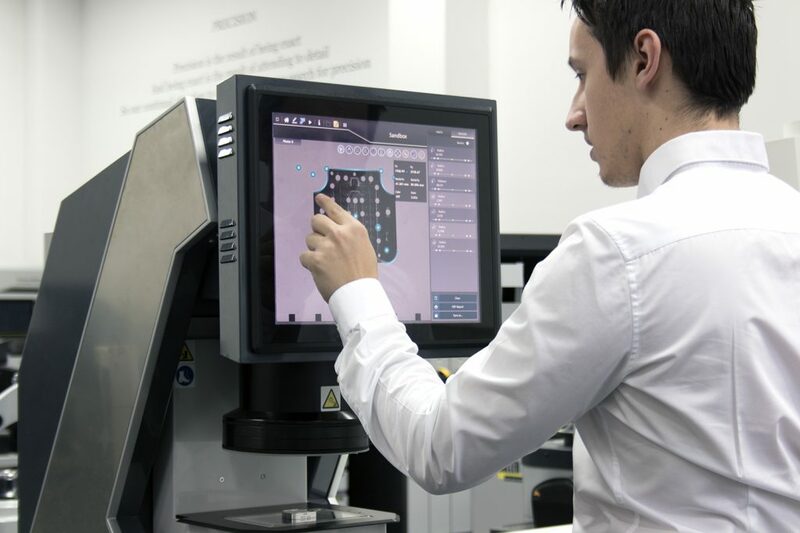 There is no need to locate the machine in a metrology lab – it has been designed to stay in production. TRADITIONAL TOOL: Point-by-point measuring – When using a profile projector, the points must be detected manually. The positioning procedure takes both time and expertise, and the results obtained can be highly subjective. OPTICAL MACHINE: Instant measurements – The optics acquire the complete image of the part, with all points instantly detected. The software provides the operator with a range of simple tools to automatically detect hundreds of points. Create a measurement program in a matter of seconds with ‘gesture,’ a feature of the Metrios’s multi-touch screen. TRADITIONAL TOOL: Results written manually – After measuring a part with a traditional machine, the operator writes the results down manually. This requires time and can lead to errors in reading, writing and interpretation. Assessing a good/bad outcome requires concentration from the operator. This activity may also be subject to error. OPTICAL MACHINE: Automatic data and statistical collection – A histogram provides an immediate preview of the measurements taken and indicates any deviation from the nominal value. The system produces a complete and customisable measurement report. The data can be exported in CSV and Q-DAS. TRADITIONAL TOOL: Dozens of calculations needed for tool correction – The wear of tools during production must be monitored and frequent inspection is necessary to keep production in tolerance. The operator must write and calculate the values to know when to intervene on the worn tool. OPTICAL MACHINE: Immediate correction of tool parameters – The ‘measurement trend’ panel shows the operator the trend of the values collected during a series of measurement cycles. The same panel provides an immediate extraction of the deviation values which are useful for tool correction. This procedure drastically reduces the number of rejected parts.